December will be here tomorrow, Christmas is right around the corner and then New Years. With New Years many people set resolutions to get healthy, lose weight and exercise. Scott and I are no different. 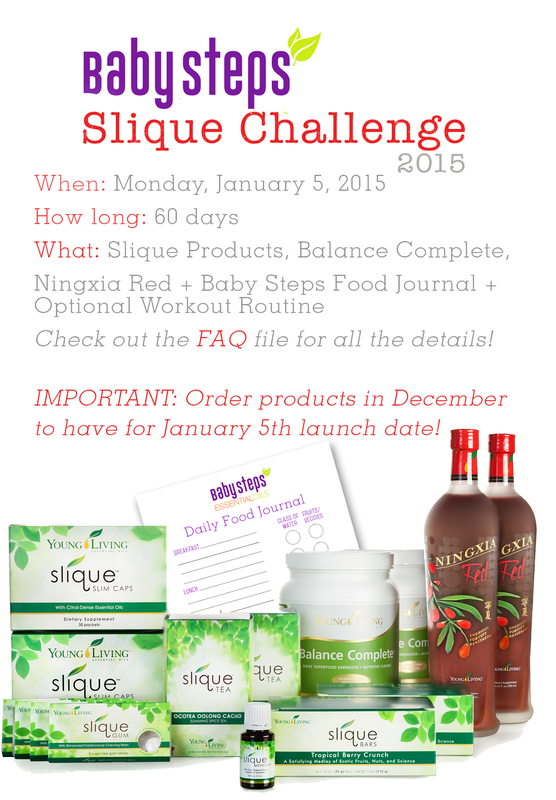 The Baby Steps Team is doing a 60 day Slique Challenge beginning January 5th, 2015. Scott and I will be both doing this challenge along with some my Oily Journey Team. Now is the time to get your products ordered so you are ready to begin in January. However, I feel like I need to start in December. This way I can better answer questions my members may have while we are doing it. I guess mine will be the 90 day Slique Challenge. If you would like to join Young Living, the Baby Steps team and the Slique Challenge, let me know and I would be glad to help you set up a wholesale account with Young Living or you can click here to go straight to the sign up page. A little history here. I have been drinking Slique Tea for a while. I LOVE it. Back in late April and early May, I was using Slique Essence and Slique Tea and saw that my sugar cravings and hunger we improved which was good at the scale. Then I had surgery and never got back to it. I was still drinking the Slique tea and sometimes drinking the Slique Essence – just not consistently. I have been struggling with my weight loss attempts – let me rephrase – I have not been doing what I know to do (AGAIN – seems to be a pattern with me). So I decided it was time to get serious. I knew that I was going to actually follow my Weight Watchers again – tracking, eating lots of fruits and veggies, lean meats and moving more (moving more sounds so much better than exercise). I knew I wanted to do the Slique Tea and Slique Essence consistently again. I also wanted to try Slique Caps and Balance Complete. So I decided to go for it. Scott and I made out a plan – his is a little different from mine. I posted our plan yesterday on Facebook for my Oily Journey Team but need to post it here for accountability. We will be drinking a Balance Complete shake each morning for breakfast. We will both drink at least 2 oz of Ningxia Red each day. We already do this, we will be continuing it. We will be drinking Slique Essence in our water multiple times a day. I will be drinking Slique Tea morning and afternoon. Scott has started drinking green tea and will continue with that for now. I will be taking Slique Caps before supper. Scott is still trying to decide if he is going to take them. I will be tracking what I eat and points plus values using my Weight Watcher App. For my ww peeps – Balance Complete it 5 pp+ with water and 6 pp+ with unsweetened almond milk per serving. When Slique Bars come back in stock we will also be eating them for snacks – they are FABULOUS! WW peeps, they are 4 pp+ each. I will be walking and riding my recumbent bike for exercise. I wear a fitbit and my goal is 10,000 -12,000 steps a day. Scott will continue his cardio/ lift routine. SSSSHHHHHHH!! He is also getting a fitbit for Christmas. We have not decided if we are going to do the Cleansing Trio. We will weigh in weekly, me at my Weight Watchers meeting and Scott at home. We will also be doing monthly measurements. Kim (and sometimes Scott) will be blogging our journey through this challenge. If you are part of my Oily Journey team, the FAQ and Food log are in the files section of our group page. If you are not part of my team, let me know and I would be glad to help you sign up. We are part of the Baby Steps team. Not only do you get amazing Young Living Essential Oils, you also get access to private FB groups, training and a great team filled with many years of experience with Young Living Essential Oils and products.